Alison Wilder's installation in Works Progress at the Invisible Dog. We hope you will join us this weekend for Alison Wilder’s solo show in the elevator at the Invisible Dog in Brooklyn. Installation is going on today and we’ll be open Sunday from 11 am to 7 pm. It may be hot, but the Invisible Dog will be giving away wine at its End of Season party, happening simultaneously. The Invisible Dog’s party will feature a grill in the newly open garden, live music, and the last chance to see Momo’s solo exhibit If You See Nothing Say Something on the third floor. Alison Wilder‘s installation, Why neutral, will reimagine the large freight elevator shaft, taking it from raw industrial space to art experience. 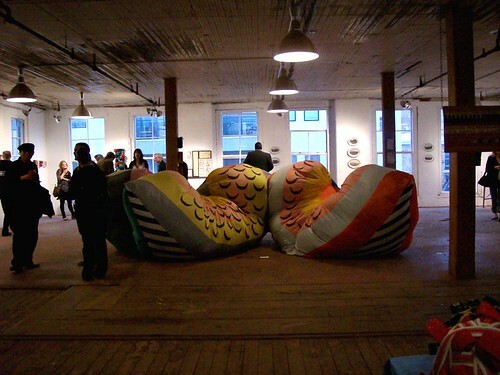 For our spring show, Works Progress, Wilder created a colorful inflatable fabric sculpture. The Brooklyn-based artist grew up in Vermont and Iowa, and recently graduated from Bard College. She focuses on sculpture, textile processes, queer politics, and homesteading activities through large-scale, site-specific, mutating sculptures. This Sunday’s Why neutral installation includes sculpture by Alison Wilder, and video by Rachel Schragis and Alison Wilder. Aspiring Recession Artists who attend Why neutral will receive a coupon for $5 OFF their submission fee.